We were always a fan of those puffy Moncler jackets even when they made us look even puffier after an Aspen ski week of sauvignon blanc and truffle fries, but the debut of the company’s couture collection Gamme Rouge by Giambattista Valli and Gamme Bleu Thom Brown has made it the premium high-end ski clothing in existence. Located in a Hyman Avenue storefront, from afar it could just as easily be an outpost of Columbia or North Face if not for the fancified windows of Euro-looking ski apparel and quaff catwalk of Aspen locals that stalk its doors in high-season. 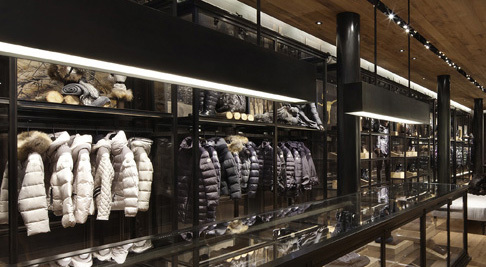 The store was the first outpost of Moncler in the US, now with an outpost in Soho, offering a more conservation presentation of the line’s collection as well as shipping serviced for things like ski knickers or thermal bustier that they may not carry in stock. More for the super-rich than mere rich, don't expect to find much of anything for less that $700 in the store. 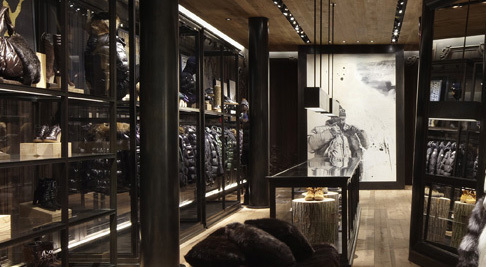 Top ski fashion couturier offers Aspen outpost with collection of Gamme Rouge by Giambattista Valli and Gamme Bleu Thom Brown consider chicest on the slopes.